Hello Kitty is a girly pink wordpress template. It’s a 2 column theme with white main content area and pink sidebar located on the right side. The search function is on top of the sidebar while below it are all the standard wordpress menus. Header graphic contains the Hello Kitty character and two small frogs. The site is mostly pink with a touch of white here and there. 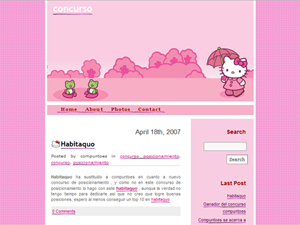 Hello Kitty wordpress theme was designed by Ivan Garcia.